Once our vision was clear, the next step was to build a backlog. In agile terminology, a backlog is a list of requirements you need to fulfil to build your product. Each requirement is materialised by user story (US) and is elaborated from a user point of view: the project plans building of the product for the user iteratively. Your final product is then only composed of functions that add value for the user. I like using the “As …, I want to …, so …” pattern while writing my user stories: it shows the purpose of the US right in its description. All US have conditions of satisfaction. The conditions of satisfactions are used to qualify the job you have to accomplish on the US: once the conditions are met, you can consider the US as done (and move on to the next one). We would like to share with you our trip preparation backlog, per season. This is the first part (2012 and 2013). As you will see in the backlog below, when a US was completed and we started to make use of it (of the functionality)… it lead to create new requirements for the project: new US were added to the backlog. Let’s start with our first season! Pierre giving me sailing lessons was just not an option for the couple. In France, no licenses are required for sail boats. We decided to get one anyway because it’s kind of ridiculous not to learn the basics properly. Also, the license give you the right to use the radio (VHF) on board in the french waters. So, we took the lessons together. Our instructor had the best student and worse student in the same group… no names provided, I let you guess. This US lead to more US (like #6). US #7 and US #8 spawn from this US. 3rd reef has been quite useful already. We are lucky and we never had to use the storm jib – for now. We rarely use the engine, even less now that the lightest breeze can make us move. Only one system to master to furl them all. 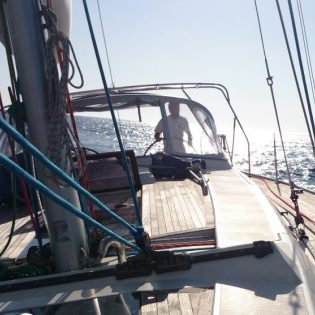 We installed solar panels and changed a few things on board in order to solve this US. A dedicated post will follow soon! We are looking forward to hearing from your backlog! For the following iterations, check here!